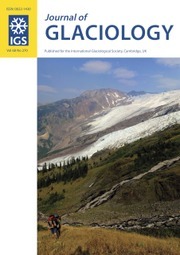 Journal of Glaciology publishes original scientific articles and letters in any aspect of glaciology- the study of ice. Studies of natural, artificial, and extraterrestrial ice and snow, as well as interactions between ice, snow and the atmospheric, oceanic and subglacial environment are all eligible. They may be based on field work, remote sensing, laboratory investigations, theoretical analysis or numerical modelling, or may report on newly developed glaciological instruments. Subjects covered recently in the Journal have included palaeoclimatology and the chemistry of the atmosphere as revealed in ice cores; theoretical and applied physics and chemistry of ice; the dynamics of glaciers and ice sheets, and changes in their extent and mass under climatic forcing; glacier energy balances at all scales; glacial landforms, and glaciers as geomorphic agents; snow science in all its aspects; ice as a host for surface and subglacial ecosystems; sea ice, icebergs and lake ice; and avalanche dynamics and other glacial hazards to human activity. Studies of permafrost and of ice in the Earth’s atmosphere are also within the domain of the Journal, as are interdisciplinary applications to engineering, biological, and social sciences, and studies in the history of glaciology.